NuovaSimonelli has been producing espresso machines since 1936. The brand NuovaSimonelli is synonymous with reliability and innovation. The NuovaSimonelliGrinta is a semi-commercial doserlessgrinder that dispenses ground coffee directly into an espresso portafilter to capture all the aroma and flavour of your gourmet coffee beans. The Grinta dispenses ground coffee with an on demand "touch n' grind" switch for true, one-handed operation. Simply place your portafilter handle under the coffee outlet and push slightly to engage the micro-switch. The Grinta will grind the coffee quickly and effortlessly. Release the handle slightly and the Grinta will immediately stop grinding. While the Grinta can grind any style of coffee from Turkish to French Press, it has several different grind settings in the espresso range so you can find the perfect setting that gives you a rich, crema-topped espresso. 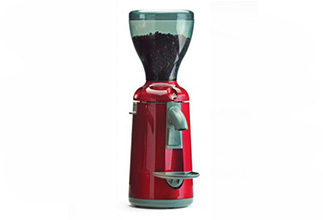 The NuovaSimonelliGrinta comes in 3 colors: Cranberry Red, Black, and Metallic Silver.